The SpectraRad avoids these problems at a comparable cost, higher speed and small footprint because it acquires hundreds of data points across the visible spectrum. In addition, the 2048 pixel linear CCD array provides the precision required to accurately measure narrow bandwidth light sources or LEDs. 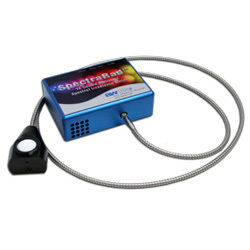 Having multiple sensors also enables the unit to report spectral data and display spectral graphs, making it the ideal instrument for evaluating LEDs, which are today’s dominant light source.